Park Seo-Joon is the recipient of the 2018 Star of Korean Tourism Award! On December 11, Park Seo-Joon attended the 2018 Korea Tourism Awards ceremony at the Gyeongwonjae Ambassador Hotel in Incheon. 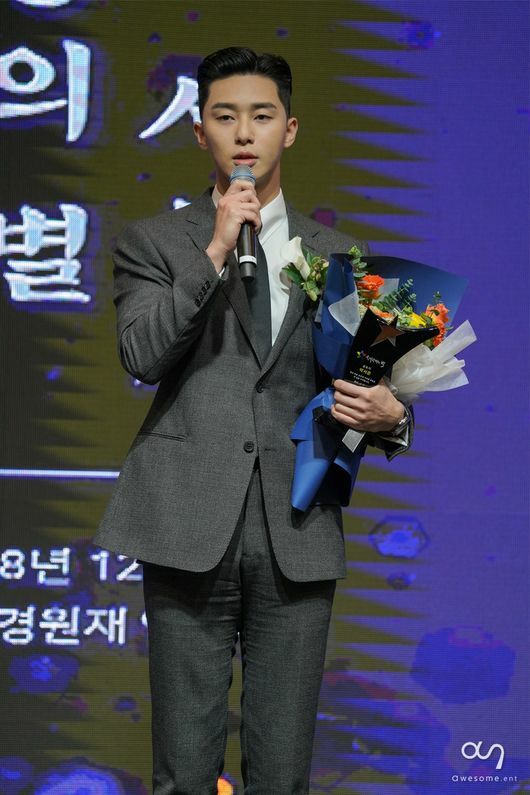 During the event, the actor was awarded this year’s Star of Korean Tourism Award, which recognized him for his contributions to Korean tourism. The award was first invented in 2010 to discover and represent those who have contributed much to the growth of Korean tourism. Some examples of previous winners include Bae Yong-Joon, Kim Yuna, So Ji-Sub, Jun Ji-Hyun, Lee Min-Ho, and Park Bo-Gum. This past year, Park Seo-Joon received much love and recognition from the public for various hit dramas such as tvN’s “What’s Wrong with Secretary Kim?” and worked hard towards the spread of Korean culture and media. This led him to win the Best Actor for Hallyu Dramas Award at the 2018 Seoul International Drama Awards in September, proving his endless fame and popularity throughout entire Asia.